Famed photographer Neil Leifer – whose iconic photography is currently on exhibit at the Sports Legends Museum, – will tell you without hesitation, which of his many photographs is his favorite picture taken during his illustrious career. And it’s not one you might expect. Full article with slideshow here. Related: Monroe Gallery of Photography at the DC Fine Art Photography Fair Oct 4-6. Monroe Gallery of Photography is pleased to be a returning exhibitor for the second Annual DC Fine Art Photography Fair. The Fair takes place on Saturday and Sunday, October 5 and 6. The show will be held at the West Hall Conference Center, George Washington University's MOUNT VERNON CAMPUS, conveniently located at 2100 Foxhall Rd, NW, Washington, DC. [Whitehaven Parkway Entrance]. The Second Annual DC Fine Art Photography Fair will feature 18 of the best fine art photography galleries from across the United States, each representing the masters of photography, from classic 19th- and 20th-century photographs to cutting-edge contemporary images. Monroe Gallery will be exhibiting a special collection of significant 20th and 21st Century Photojournalism, featuring important civil rights photographs, selections from the acclaimed 1963 exhibition, a rare vintage portrait of Robert Capa taken on board a ship prior to the Normandy landing, Stephen Wilkes' stunning large format print of Hurricane Sandy, Seaside Heights, NJ, 2012, and much much, more. All Saturday and Sunday events are FREE and open to the public. We look forward to seeing you! We must forever conduct our struggle on the high plane of dignity and discipline. . . . 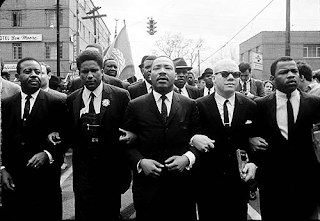 Under the inspired leadership of Martin Luther King Jr. (1929–1968), nonviolent protest became the defining feature of the modern civil rights movement in America. A brilliant strategist, King first demonstrated the efficacy of passive resistance in 1955–56, while helping to lead the prolonged bus boycott in Montgomery, Alabama, that succeeded in dismantling bus segregation laws. Fresh from the victory that brought him national recognition, the charismatic King cofounded the Southern Christian Leadership Conference and took the lead in directing its civil rights initiatives. In a carefully orchestrated campaign of peaceful protest to expose and defeat racial injustice, King awakened the nation’s conscience and galvanized support for the landmark civil rights legislation of the 1960s. Honored with the Nobel Peace Prize in 1964, he took a public stand against American involvement in the Vietnam War and also became a vocal advocate for those living in poverty. King’s words were as powerful as his deeds, and his moving and eloquent addresses, which gave hope to millions, continue to inspire people throughout the world. Unless otherwise noted, all images are from the National Portrait Gallery, Smithsonian Institution. As we mark the fiftieth anniversary of the 1963 March on Washington for Jobs and Freedom and Martin Luther King Jr.’s iconic “I Have a Dream” speech, I believe it is important to remember King not merely as a dreamer but as a doer. In his thirteen years of public life as an advocate for civil rights, economic opportunity, and world peace, King motivated others not only by communicating his vision for a brighter future but by acting boldly to challenge injustice. Despite enormous odds and the ever-present risk of failure, King led by example, exhibiting courage and character as he maintained his steadfast commitment to nonviolent resistance and direct action. Anyone can dream of a better and more just world. Martin Luther King Jr. dedicated his life to making that dream a reality. This exhibition has been funded by the Guenther and Siewchin Yong Sommer Endowment Fund and an anonymous donor. "Finding Vivian Maier represents the resumption of the quest. Not only is Maloof a major presence and voice in its 83 minutes, he’s also the film’s co-producer, co-writer and cinematographer. Poignant, not a little sad, occasionally disturbing, the documentary does a yeoman’s job filling in quite a few of the blanks in the Maier biography and, by extension, her photographic practice. Who knew she went on a solo, around-the-world trip in 1959? Or that she tried to go into the postcard business in France? Or that she could be “mean” to some of her young charges? Still, as Roy Orbison would put it, she’s very much “a mystery girl” and likely will remain that way. This is not an entirely bad state of affairs, especially for her art. The great thing about Maier initially was that she seemed to come out of nowhere to posthumously elbow her way near the top of the photographic class. All there was was the art – pure, mysterious, uncompromised by gossip, New Yorker profiles, tweets, visits by TV crews to her nursing home. What we knew is what she saw and we saw that it was good." "In a digital world, the pre-eminence of Vietnam-era photography is unlikely ever to be duplicated"
"Perhaps even more viscerally even than on television, America’s most wrenching war in our time hit home in photographs, including these three searing prize-winning images from The Associated Press newsmen Malcolm W. Browne, Eddie Adams and Nick Ut. They are the subject of retrospectives now, in a new book and accompanying exhibitions. No single news source did more to document the bitter and costly struggle against North Vietnamese Communist regulars and Vietcong insurgents, and to turn the home front against the war, than The A.P." Full article here. 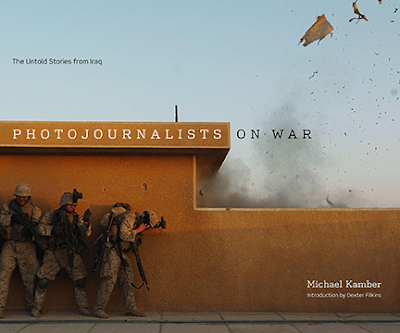 (University of Texas Press) by Michael Kamber with a foreword by Dexter Filkins will be projected during the evening screening tonight, Thursday, September 5, at this year's international photojournalism festival at Perpignan in France. On Friday, September 6 at 16:00 hours, there will be a book signing with Michael Kamber and some of the photographers featured in the book in the courtyard of Le Poudrière near the Festival's bookshop, The Chapitre, where the book can be bought. Photojournalists on War (University of Texas Press), which published in May of 2013 and has been receiving critical acclaim worldwide, is a ground breaking new visual and oral history of America's nine-year conflict in the Middle East. With visceral, previously unpublished photographs and eyewitness accounts by the world's top news photographers, Michael Kamber, a writer and photojournalist for over 25 years, interviewed thirty nine colleagues for the book, many of them from leading news organizations including Agence France-Presse, the Associated Press, the Guardian, the Los Angeles Times, Magnum, Newsweek, The New York Times, Paris Match, Reuters, Time, The Times of London, VII Photo Agency, and The Washington Post. Michael Kamber (www.kamberphoto.com) was the Times' principal photographer in Baghdad in 2007, the bloodiest year of the war. Other conflicts he has covered for the Times include Somalia, Afghanistan, the Congo, and Liberia. Kamber is an adjunct professor at Columbia University, and has taught at the Corcoran College of Art and Design, and the International Center of Photography. He is the founder of the Bronx Documentary Center (www.bronxdoc.org) and is the recipient of a World Press Photo and many other awards. A video that took 80 years to make. The LIFE and times of my father, Photographer BOB GOMEL. If he is not in the photo, he took the photo. My dad was born (1933) and raised in New York City. After serving in the Navy, he began working for LIFE in 1959, producing many memorable images. When LIFE ceased being a weekly in the early 1970s, he began taking photographs for other major magazines. Also in the 1970s, he branched out into advertising photography.